Are you going stir crazy? Spring Fever hitting hard? Well Scrap-Diner has the cure for March Madness...more Madness...Diner Style. Get ready for 7 days of fun and funky challenges that will help your mojo go from mundane to insane. Challenges will be posted daily beginning March 2nd by our Fabo DT. Then you have the ENTIRE month of March to complete them! Seriously...what do you have to lose but your ever lovin' scrappin' mind! The Prize? 3 lucky winners will receive a $25 Gift Certificate to the best scrappin' Diner around. You must follow the rules of each challenge, post to the gallery, then link your artwork to the appropriate challenge thread to be eligible for the drawings. Yes, you can do challenges as many times as you want to increase you chances of winning! 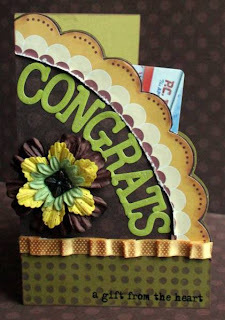 Unfortunately, I found out last night that I didn't make Spellbinders final Design Team! Awwww! But I did create an awesome LO as a result of competing in the top 24! I was given the choice to make a card or a LO and then sent 2 sets of die cut templates (butterflies and a scalloped heart). I don't own a die cutting machine (well except my cricut) so I ran to Scrapper's Cove on my lunch hour and cranked out a bunch of die cuts to be used on my LO. I had no idea what the LO was going to look like, only that I wanted a sort of vintage feel. I grabbed a sheet of Graphic 45 pp and white bazzill (I figured I could always change the color to match my LO) and went to town. I took my die cuts home and this is what resulted! Oh and FYI, my head isn't really lopped off like that in real life! LOL! I took this picture after my baby shower last March, so forgive the scalping! 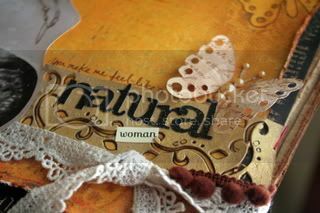 I titled this LO Natural Woman for 2 reasons. I don't think I've ever felt as feminine and womanly as I did when I was pregnant with my sons. Any of the flaws that I saw in myself no longer mattered to me. I felt almost invincible, if that makes any sense to you. 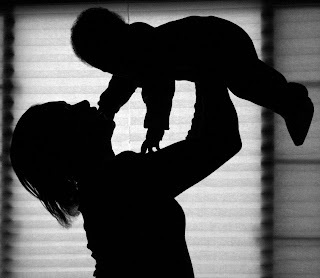 Also because I gave birth naturally, without the use of drugs. I don't know what possessed me to do it, but for some reason, I needed to at least try it! Yeah crazy... I know! LOL! Now for the close-ups! 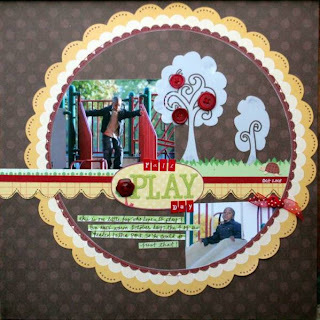 Prima and Graphic 45 came together wonderfully here! To Top it off, I found a beautiful piece of corrugated cardboard, which I inked, to serve as the background. As you can see here, I cut the scalloped hearts from patterned paper and corrugated cardboard. I layered the butterfly for dimension, but not before I spritzed the bottom one with sandy beach glimmer mist and the top one with dreamsicle glimmer mist. 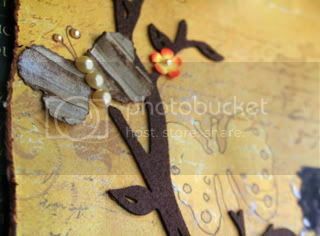 I also embossed the top butterfly and stencilled with chalk and decorated with Kaiser pearls and Prima gem flourishes to really give it character. 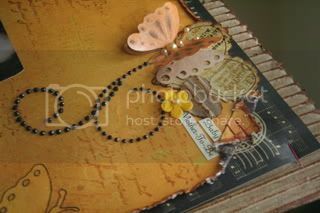 I also stamped some of the butterflies with my french script stamp after spritzing with glimmer mist. I think I've said it before, but this is my all time favorite stamp! I've used it on a lot of projects! Here I die cut 2 tiny scalloped hearts from cardboard using the template that they sent and then ink them and layered them to form another type of butterfly. 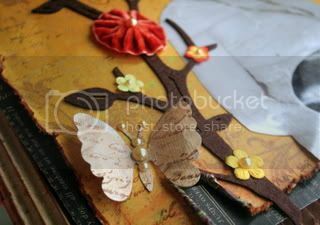 I also used the die cut butterfliy as a mask when spritzing glimmer mist on the background paper. I cut a piece of packaging from my Prima lollipop flowers, sprayed it with gold glimmer mist and then used it to form my title block. Then decorated it with Prima lace trim, bazzill pom pom trim and yet another butterfly. This photo technique was very easy to create, I wanted it to look very natural as if you were seeing the baby through my belly. First I printed the photo of me onto a self adhesive transparency (I think they're made by Grafix), then took a piece of tracing paper and placed it on top of the photo and drew an oval shape just inside the belly area. 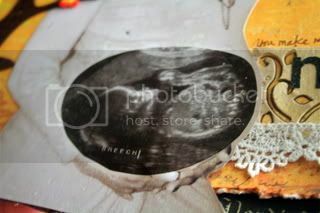 I then cut out the oval and used that as a template for my ultrasound picture. I cut the oval out of the ultrasound, peeled the backing from the photo of me and put in on top of the trimmed ultrasound pic where I wanted it to go. I then placed the combined picture on a piece of white cardstock, cut the picture out and adhered it to my layout. Although I didn't make the team, I was asked to be a guest blogger so we'll see how that goes! 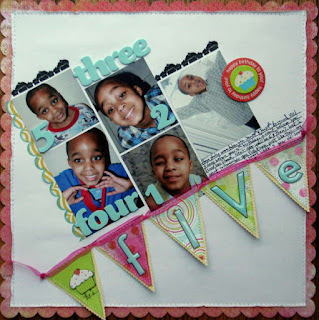 Everyone is having a blast over at Serendipity Scrapbooks!! This weekend is the flashback reunion crop and design team members from the past 3 years have joined the current DT members to come up with some really great challenges to get you scrapping!! Serendipity is near and dear to my heart because this was my first DT, so of course I jumped at the chance to help out. I came up with the Retro Products Challenge- the purpose is to get you to turn your old stuff new again by adding a little flair! I have had these KI Memories papers forever!! I made them hip again by using smaller amounts of each pattern and mixing and matching to create a simple, sleek layered look. I added a small strip of lace cardstock to give them a nice modernized finish. Check out the metal tag...remember those? 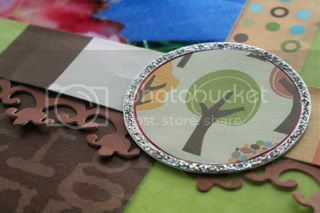 I simply cut a small piece of patterned paper to fit the center and coated the metal rim with stickles. 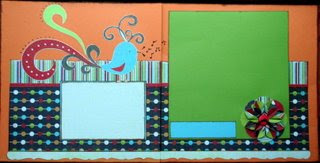 Stickles are fabulous for adding pizazz to any element! 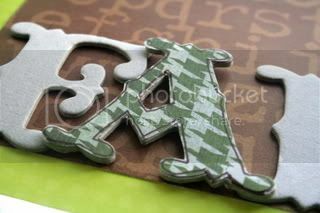 I made these old chipboard letters new again by pairing them with a very hip pattern...doesn't get any hotter than houndstooth, right? 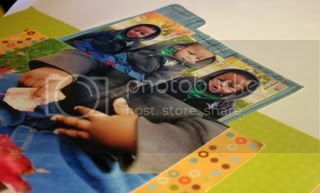 The 5x7 photo actually serves as a pocket to store additional photos and hidden journaling. 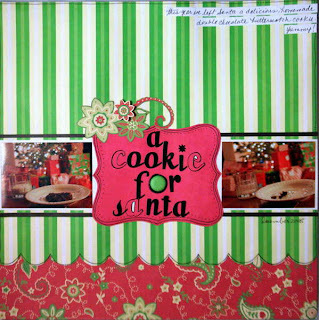 The design of this LO is a lift of Christi's design seen here. She is this month's DT spotlight over at scrap-diner.com. I had the pleasure of working with Turtles and Trees line this month! I created these yesterday while I was home nursing a child with the pink eye! If you've ever seen the movie "The 5 Heartbeats" then you'll recognize the title of this LO! 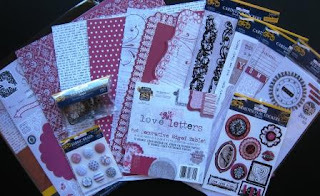 I just received the products that I need to use for part 2 of Spellbinder's Design Team search. I have to admit, I'm a little nervous so no ideas have popped in my head as of yet. Guess I'll just have to sleep on it, sometimes my best ideas come during sleep (probably the reason I don't sleep well- my mind is always reeling!) LOL! My project is due this Sunday, so I need to hop to it! Anyway, cross you fingers and toes for me! I should know something before the end of the month! On another note, workshop registration opens up later this week for the Croptopia Weekend Getaway event coming to Parsippany, NJ this March 27th-29th, so stay tuned! You don't have to spend the entire weekend to participate in the fun. Classes are open to the public and if you are unable to join us for the weekend or the day, you can stop by the Marketplace on Friday from 4-8pm OR Saturday from 10-5 and shop for all your scrapbooking favorites for just a nominal fee of $5 at the door! Click on the link for all the info you need! I'm giving you an early peek at the workshops I'll be teaching that weekend. 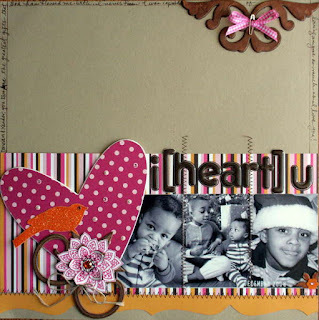 The Bag Full Of Love is a super fun 1o page mini album filled with embellishments and features Basic Grey's Bittersweet line! 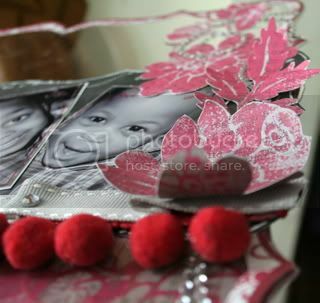 I first found this little bag idea as part of online crop and I actually custom created the template to suit my needs. There will be a maximum of 20 students for this class with the option of purchasing kits after class. 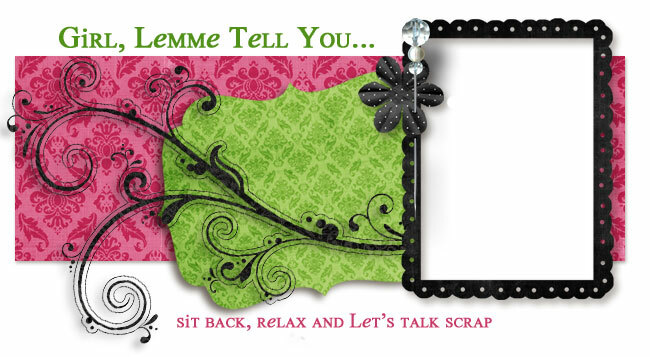 I'm also teaching a 2 page Spring LO featuring My Mind's Eye's new Penny Lane Line. This LO has enough space for 2-4x6 photos, 2- 3.5x5 photos and journaling! I'll also demonstrate a simple doodling technique and a paper folding technique! There's a maximum of 15 spots; kits will only be available if the maximum number has not been reached. I hope to see you there...we are going to have a ball!! DH: there's a hotel near your job that starts with an H...not the Hilton, do you know which one I'm talking about? 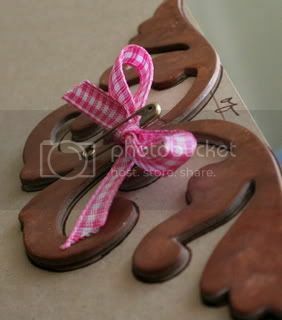 It was so obscure and not the most romantic offering of a gift, but I guess I know he listens to me...sometimes! That's soooo my hubby's style, guess I gotta love him! Lucky for me, he doesn't read my blog, so I don't have to apologize for being wrong! LOL! 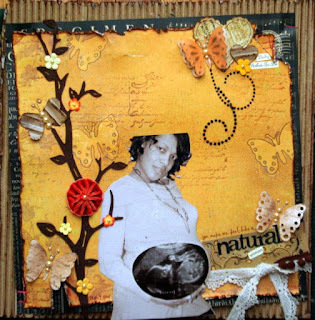 DreamGirls challenge #22 went up this morning and boy did we have a ball with this one! 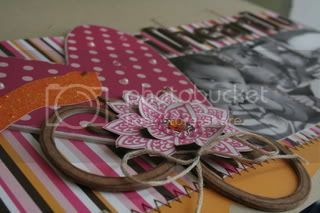 The challenge was to use 80% American Crafts products, at least one flourish and at least one heart on our LOs. Check out what the rest of the DreamGirls came with! I created yet another LO about my babies, because I just love them so much and I adore these photos I took of them on Christmas (and just before). I changed the photos to b/w so the colors didn't clash with the papers (which I've been dying to use). Who says you can't use pink on boy LOs? Certainly not me! I love crossing the "color barrier" and it was easy to do here because the page is about love, so the pink translated well. journaling: Donovan & Xander, you two are the greatest gifts that God has blessed me with. I never knew I was capable of loving anyone as much as I love you! close up of the flower: I cut some of the petals with my craft knife and curled them up to add dimension to the flower and then added some bling to dress up the centers. I cut the bird from a piece of AC patterned paper- originally, it was pink and facing the opposite direction, I just flipped it over to the orange side, covered it with stickles and added a gem to form the eye. 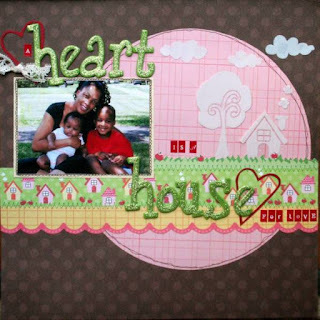 I also added Kaiser's pearls and pink rhinestones to some of the polka dots on the patterned paper covering the chipboard heart. I love adding as much detail as I can to all of the elements on my LOs. I think the stitching and the floss tied in a bow gives this a nice "homey" feel. Thanks for taking a peek and I hope you play along and join in on the challenge. This weeks prize is going to be awesome (especially if you love American Crafts as much as we do)! I'm soooooo tired!! I was up until 2 am prepping kits for the classes that I'm teaching at Croptopia Getaway next month and I've been at it ALL day long and I still have a lot to do! My Cricut is getting a serious workout, so are my punches! I'm tired of counting and recounting all of the elements, but I am excited and eagerly anticipating the classes! I hope to have a great turnout! The workshop schedule is supposed to go up on Croptopia's website later this week. 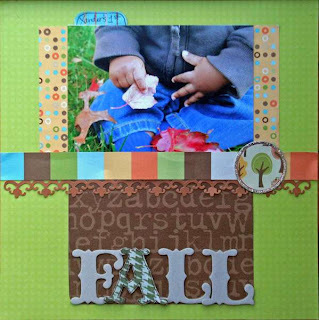 I created a cute 2 page LO featuring MME's new Penny Lane Line. It's perfect for Spring and Summer photos. I also created an adorable Bag of Love mini album featuring Basic Grey's Bittersweet Line. 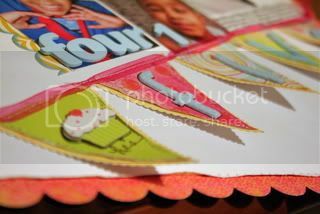 This mini is jam packed with coordinating embellishments and has plenty of space for for photos and journaling! I took the photos starting 5 days before his birthday, but I forgot to take one on day 3, which lead to me spelling out some of the numbers. I've been using a lot of white cardstock lately which ir very much unlike me, but I love the clean look. This is a close-up of the banner I made. I stitched the triangles to solid paper and then used shaped scissors (remember those?) for a nice scalloped trim. I then adhered to my LO abd stitched a piece of ribbon across the top. I've been in a 2 page state of mind lately, too! I think I've created 3 or 4 this month! I used a pagemap for this one. The original sketch is a double 8.5x11, but I adapted it and made it 12x12. This LO is about spending time with my girls! journaling: We are spread out over 3 different states: NJ, MD, & VA, but whenever either of us needs a break from real life, those state lines are quickly erased and we find ourselves gathered together for our infamous girl's getaway weekends. It only takes 1 email to set off a chain of events: planning, anticipaing, and executing our weekend. Sometimes our weekends are so packed w/ things to do that we need a vacation from our vacation. But no one complains because we usually have so much fun hitting the spa, the club, the mall, catching a comedy show, taking a city tour and just plain celebrating years of friendship. I look forward to many more years with my girls! DreamGirls new challenge is going up tomorrow! Here's a sneak peek of what's in store. So how was your Valentine's Day? Better than mine, I hope! 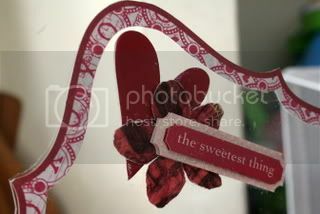 Mine was just an ordinary day as usual, no special trinkets or anything for me, except the card Donovan made for me in school. You'd think after nearly 15 years DH would get it...but nope! So although, I say whatever to not getting any romantic expressions of love, I'm moping around with a sad look on my face. But anyway...check back for some new projects featuring My Little Shoebox's new Turtles and Trees line! It came in the mail Thursday and I can't wait to play with it! Well, thanks for stopping by! I now have to entertain my antsy 5 year old who seems to be bouncing off the walls because he has not left the house today. Sometimes I forget that little kids are sometimes like little puppies, they need fresh air or they go crazy! LOL! Posted on My Little Shoebox's blog! I remember taking this photo like it was yesterday...it's hard to believe it was 9months (may as well say 10 months ago). 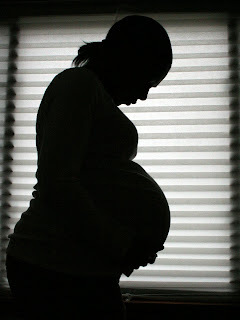 I was 9 months pregnant and the day I took this was 9 days before I gave birth to Xander. I remembered being so ready to get the pregnancy over with so I could meet my little guy. Here we are 9 months later! He's bought so much joy into our lives. I smile every single morning because he wakes up with a smile on his face (most mornings). He's going to be 10 months old tomorrow and boy let my tell you, he's a little pistol already! He knows what he wants, he loves to eat, he grunts when he's trying to get my attention. He started cruising around the furniture (teeny tiny steps), his 2 top teeth have just broken through, for a grand total of 4 pearly whites. He responds to Donovan so well. If I ask him "where's Donovan?" he looks in his direction, it's so adorable and Donovan really gets a kick out of it. We love this little boy so much, he has changed this whole family. Of course we've always loved each other very much, but Xander brings in a different element. Watching the way Donovan and Troy love him, makes my love for them grow even more and vice versa. KWIM? Anyway, thanks for listening to me ramble...enjoy your week! You don't know how excited I am that we're finally finishing our basement!!!! Oh my gosh, we need the room so bad, my living room looks like a disaster area between my scrap stuff and toys plus that fact that it's small to begin with! 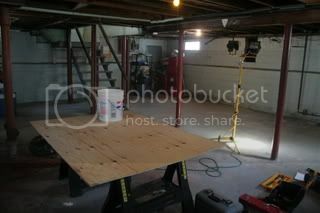 Renovating the basement means that I am finally going to have my own scrap space....oh this makes my year! I can't wait until everything is complete. We're not doing anything fancy because this is costing us an arm and a leg, but I don't care, I just want it done. We'll finally be able to move our office out of the 3rd bedroom to the basement and we'll move the baby out of our room into his own room! I'm so excited...YAY!!! 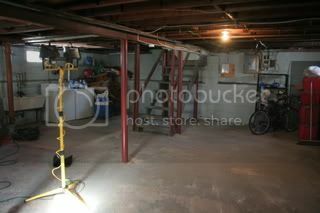 This is what my basement looked like up to this past Wednesday, the day Fred started on it. The only difference is all of the stuff piled up in the corners, along with about 10 industrial sized garbage bags of stuff was piled in the middle of the floor. I went through the basement Tuesday night. Troy took all of the bulk trash to the garbage and I threw everything that I haven't seen in the past year in the garbage, hence the reason I had 10 extra big garbage bags. It felt so good to get rid of all of that clutter!!! The ceiling will be a drop ceiling and with recessed lighting by the time everything is said and done. 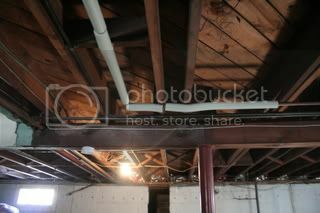 You can get a glimpse of what will be the laundry room on the left and another storage area on the right. 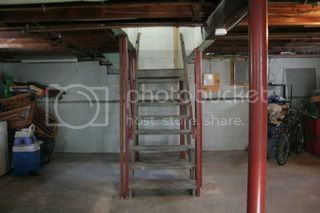 This is what the staircase looked like- he started working on this first. They're going to be encased and the backs closed and then carpeted. Oh I can't wait! 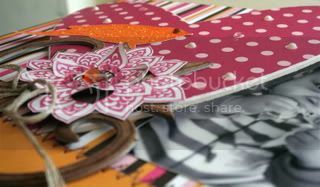 Then I can spread my scrap stuff out and I won't have to scrap on top of a 12x12 album on my lap! I'm going to have a play area down here for the boys so they can play while I scrap! Notice where my focus is...scrapping?! I started this little ole blog of mine two years ago today with 2 simple posts : A and B. I had no idea what I was getting myself into or if I'd even be able to keep up with blogging, but here I am. I love blogging, having my own little place in cyberspace where I can talk about any and everything and where I have met a ton of talented people. For all of you who follow, post on and even "stalk" my blog, I'd like to say thank you for the support, the kind comments and words of encouragement. To show just how thankful I am, I'm giving away a little RAK...instead of hosting a RAK for random traffickers, I've randomly chosen the name of one of my blog followers to receive this RAK. Soooooo Shauna, come on down!! (LOL) Email me your addy and I will get a small RAK out to you! Again, thanks so much...without all of you, I'd feel like I was talking to myself! hehehe! February is Black History month; Yesterday I was watching Noggin with my boys and I learned something new! Jack Johnson who was the world's first African American heavy weight champion (I knew that part) invented the wrench. Well I googled it and he actually patented improvements to the wrench and invented a theft prevention device for vehicles...who knew?! Just thought I'd share- I love learning new things! My Little Shoebox is having a contest!!!! Six lucky winners will have a chance to win one complete line of MLS's new releases!!! Stop by the blog for details and to see photos of the booth from CHA!! Also stay tuned for MLS's DT call coming next month! The current DT has been asked to stay on for another year and they're looking to expand the team. Believe me when I say that this is a great company to design for--I hope you'll give it a go! 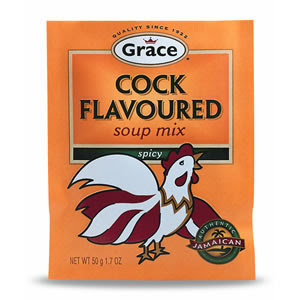 Ummmmmmmmmm, I think I'll pass! ROFLMAO!! "This month is all about Friends and we love to make new friends here at the Diner. We challenge you to come on over to the Diner forums, sign up and introduce yourself and earn a chance to win a $25 Scrap-Diner Gift Certificate plus this prize package from Little Yellow Bicycle!! We want to get to know you! The challenge this month is just that simple! Come on over, sign up, introduce yourself and post at least 20 times through-out our forums and gallery before February 28th. **What qualifies as a newbie? A newbie is anyone that has not posted in the last 6 months. " So come on over and say HI! Don't forget to mention that I sent you!! I whipped this LO up last night for my DT assignment at scrap-diner. 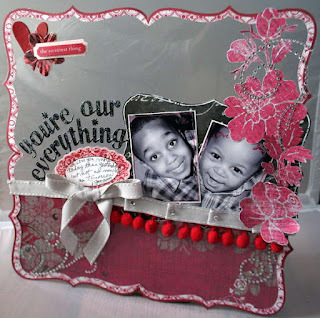 I was inspired this LO created by our Pink Lady of the month. Thanks for looking....hope to see you over at the Diner! DreamGirls challenge #21 is up and this one was one of my faves! Here's the challenge: "We challenge you to create a layout on a clear background, yes clear you can use acrylic, hambly, or transparency but we must be able to see through your layout. Our twists are simple use the word You, You're, Your etc. as part of your title, and we want to see journaling on your photo. Your journaling can be just names, a sentence or a quote." Click here to see the fabulous creations that the rest of the Divas came up with! 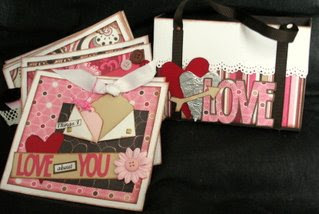 Here's my take: I used My Little Bicycle's Love Letters line- is this a great color combination or what? I used Hambly's heavy acrylic for the background and trimmed the edge to mimic the scalloped paper. I drew a frame on the photos and wrote "we love you", but it's a little hard to see in this photo. Can I just tell you how hard acrylics are to photograph? Ugh! 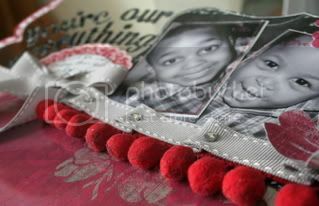 I sprayed the red pom pom trim with silver glimmer mist to dim some of the brightness of it.